Aidan Kelly of West Islip, NY is the 2015 USA Luge National Champion! 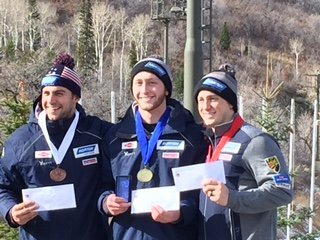 A beautiful crisp fall weekend met the athletes and spectators at the USA Luge Senior National Championship on Saturday, November 7 and Sunday, November 8 at Olympic Park in Park City, Utah. West Islip, NY - November 13, 2015 - A beautiful crisp fall weekend met the athletes and spectators at the USA Luge Senior National Championship on Saturday, November 7 and Sunday, November 8 at Olympic Park in Park City, Utah. A drop in temperatures made for perfect sliding conditions. Hard ice equals fast times and race conditions yielded almost a full second faster than in training. The weekend race held greater meeting than just the title of National Champion, it was a race within a race and the ability to travel the Fall World Cup circuit for two of the athletes competing. 2014 Sochi Olympian, Aidan Kelly of West Islip whose 2015 season was abruptly curtailed when a hard crash resulted in a flight home from Norway and surgery to be performed. Aidan was looking for a comeback and was certainly the underdog. Following the results of Seeding Race #1 held on October 30th in Lake Placid, NY Aidan was sitting on the bubble in fourth place as to whether or not he would be able to travel with his teammates as only three spots are awarded to Men’s Singles. Taylor Morris of Salt Lake City was sitting in third (the funded traveling spot). But Aidan capitalized on the hard ice conditions and placed 1st in both heats of Seeding Race #2. Aidan’s sled was clocked at 83.2 mph and 82.9 mph on runs 1 and 2 respectively. Aidan’s fourth place finish on 10/30 and first place finish on 11/7 tallied 160 points edging out teammate; Taylor Morris who finished third and second for a total of 155 points. Saturday’s race (Seeding Race #2) guaranteed Aidan the opportunity to slide on the World Cup Circuit. Sunday, November 8, 2015 the National Championship Race coupled with the outcomes of the previous nights seeding race would determine the 2015 USA Luge National Champion. Sunday’s race again proved to be a tight contest of with Aidan sitting at the top of the leaderboard. Aidan pushed the nerves aside and recorded a cumulative four run total for 3:05.274 to secure the GOLD and National Champion title. Aidan edged out teammate,Taylor Morris by +.655. Chris Mazdzer of Saranac Lake rounded out the top 3. To follow Aidan’s Fall World Cup journey log onto www.usaluge.org or www.fil-luge.org. For athlete or corporate sponsorship opportunities please contact here for more information. Subject: LongIsland.com - Your Name sent you Article details of "Aidan Kelly of West Islip, NY is the 2015 USA Luge National Champion!"